All glass, all the time. 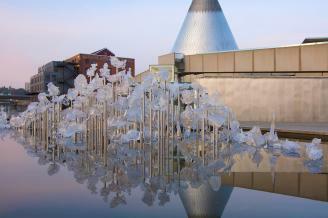 Experience contemporary glass art in a breathtakingly beautiful museum on Tacoma's revitalized waterfront. Noted for its distinctive architecture, the massive 90-foot-tall stainless steel cone houses the world’s largest Hot Shop Amphitheater. Feel the heat and watch artists in action—see a chalk sketch transformed into a beautiful sculpture or, as the artists push the limits, a pile of broken glass on the floor. In the galleries, experience extraordinary 20th- and 21st-century glass art with changing exhibitions alongside the Museum’s permanent collection. Create your own art in the Education Studio, watch a Museum-produced documentary or attend a lecture in the Theater, grab lunch or a sweet treat in the Museum Café and take home a treasure from the finest museum store around. Outdoors, the unique architecture of the plazas and three reflecting pools provides an evocative public setting for glass sculpture and leads to the Chihuly Bridge of Glass, the spectacular pedestrian walkway that features three installations of colorful glass created by Tacoma’s native son, Dale Chihuly.